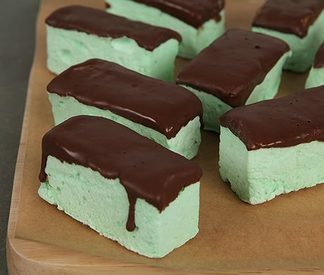 Chocolate dipped creme de menthe marshmallows! If these minty, chocolate-dipped marshmallows remind you of a certain popular candy, you're right—we had them in mind, because they're one of our favorites. But we're also very fond of this chewy, lighter-than-air incarnation. These would be great for St. Patrick's Day partys! It's just around the corner!